Webster Thailand visits Yunnan Normal University. Webster University Thailand and Yunnan Normal University in China marked 10 years of collaboration and partnership with an exchange of visits this year. 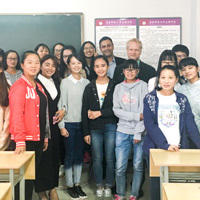 In addition to the formal meetings scheduled during Webster Thailand director Keith Welsh's visit to Yunnan, he and other Webster representatives met with alumni from the program to hear about their experiences from studying abroad at Webster Thailand. Their visit followed a March 2016 visit to Webster's Bangkok location by Yunnan Normal University’s director of International Affairs, Deng Guodong. The leaders sought to leverage the strong historical relationship between the two institutions and explore new avenues for potential innovative, long-term collaboration. See the full story on the visits at Webster University Thailand.